Daisy to the Rescue by Jeff Campbell. Review: Animals save people without being told to. Animals save people without being trained to. Animals save people out of the kindness, worry, and love in their heart. If you love this kind of reading then Daisy to the Rescue by Jeff Campbell is the book for you! Daisy to the Rescue is divided into four sections with mini stories in each. Each section is divided into different topics. For example, part one is about domestic companions that save humans lives. Part two is labeled, "TRAINED TO SERVE, INSPIRED TO HEAL." The third section is about wild animals saving people. Last but not least, part four is about legends and folktales. I enjoy Daisy to the Rescue because I like to read about animals. The short story this book is named after is about a dog named Daisy that detected breast cancer in a researcher that was studying this dog. Daisy got awarded the honor of being one of the world's first trained cancer-detection dogs, and an award for saving a pioneer researcher. Daisy is inspiring researchers to train more dogs so that they can detect cancer in people. This book is geared towards people 10 years and up. 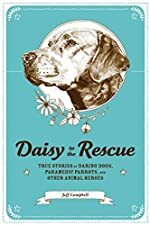 I recommend Daisy to the Rescue to everybody because the stories are so heartwarming and courageous of animals. Daisy to the Rescue will make you shed tears over how amazing these animals are. They put their life on the line to save other people without being asked to. That is amazing! Animals are an amazing companion to all I truly recommend Daisy to the Rescue to everyone! We would like to thank Zest Books for providing a copy of Daisy to the Rescue for this review. Have you read Daisy to the Rescue? How would you rate it?